Hilbre Island - a beautiful island in the River Dee. a beautiful island in the River Dee. This is an unofficial site for the well known Hilbre Island that is situated in the River Dee off the Wirral Coast near West Kirby and Hoylake. We’ve published this site to provide useful information about the island and the surrounding coastal area and hope you like it! Hilbre is actually the largest of the three islands that you can see from the shore. The smallest is called Little Eye, the one in the middle is called Middle Eye and Hilbre is the largest and the only once-inhabited one. The islands are home to a wide variety of bird and wildlife and the Dee Estuary itself is a Site of Special Scientific Interest (SSSI) – please treat the area and the wildlife with respect. 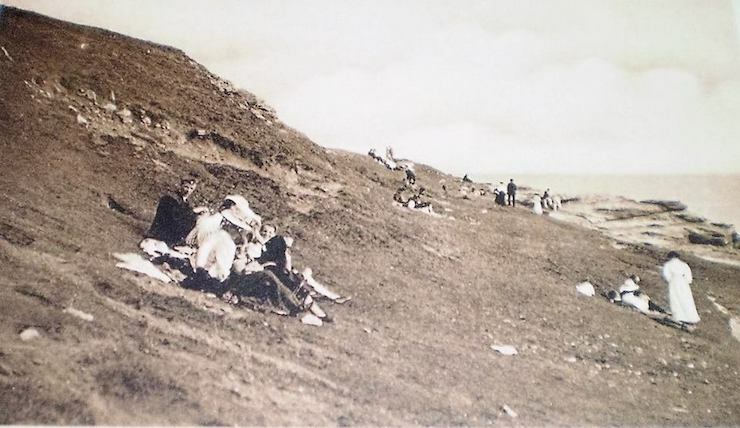 Here’s an old photo of visitors to Hilbre! Posted on twitter by @oldpicposter this old photo captures some resting visitors on the island back in 1912. To be fair, if notes on the back of the photo didn’t say otherwise, it’d be tricky to confirm that it is indeed Hilbre. Can you tell if it is Hilbre, Middle or Little Eye? An aspiring landscape photographer has photographed Hilbre Island as part of a project featuring other islands off the north west coast. Photography degree student Mikey Boardman has shot Hilbre Island along with Ynys Llanddwyn off the coast of Anglesey and Piel Island in Cumbria. Over the weekend there was an attempted break-in at the Hilbre Bird Observatory on Hilbre Island. In a tweet confirming the incident, persons unknown tried to break into the wooden building on Sunday 5th February. It is not clear if this was in the afternoon or after dark. Additional security measures have now been put in place. Did you know that award-winning crime writer Ann Cleeves once lived on Hilbre Island? 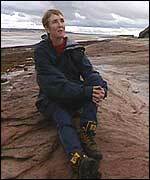 Ann Cleeves (pictured above; source:BBC) spent the first four years of her married life living on Hilbre Island. Her husband Tim was employed by the local authority as the island warden and the couple were auxiliary coastguards. You’ll probably be aware of Cleeves writing even if you’ve not read her books. Her Vera Stanhope novels have been dramatised as the TV detective series Vera and the Jimmy Perez novels as the series Shetland. She wrote her first book, Come Death and High Water, whilst living on Hilbre. You can find out more about Ann Cleeves on her website. Here’s some news that the Hilbre weather station is no longer recording data. 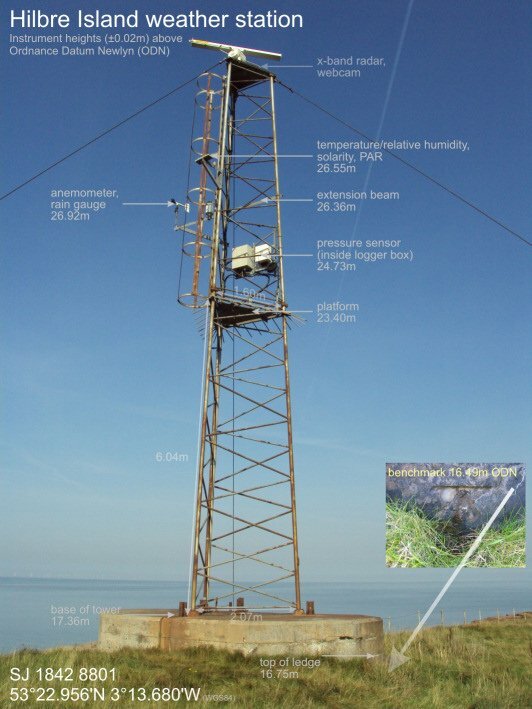 Having regularly checked the online readings from the weather station on Hilbre Island (pictured above) I’m disappointed to discover that the station is no longer recording data. Sometimes I’d use the data from the weather station as a discussion point over on my Hoylake Junction website. I noticed some months ago that the readings weren’t published on the official website. Sometimes the station would develop a technical fault that needed sorting. By chance, a friend happens to work at National Oceanography Centre at Liverpool and after chatting she said she’d have a chat with colleagues to find out what the situation was. It transpires that due to funding issues the station is no longer being maintained. There’s an amateur-maintained weather station at New Brighton and that’s possibly one of the nearest coastal weather stations on Wirral. It’s probably about 7 or so miles from Hilbre. I wonder if a local group could take over the running over this weather station? Did you know that Hilbre Island and the Dee estuary were used as decoy sites during WWII? Apparently the islands and the River Dee were made to look like the Mersey estuary in an attempt to confuse the Luftwaffe into thinking that they were bombing Liverpool. Concrete bunkers on Middle Eye housed diesel generators that generated smoke to give the impression that buildings were on fire and electric lights on poles were positioned in the sands around Hilbre. For a detailed explanation and interesting pictures of what remains of the bunkers read this forum thread though note that you will need to create a user account to see all the images. 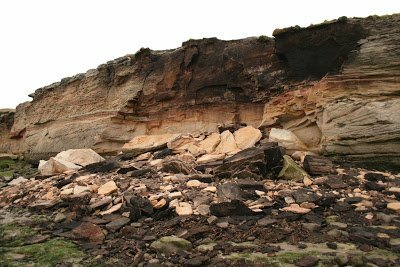 The Hilbre Bird Observatory blog has captured this great photo shown above showing that a large section of Middle Eye rock has completely fell away. I agree that the icy weather that we’ve had on Wirral this winter has no doubt been a reason why the rock has fallen away.